"Fly, Dakota Fly!" 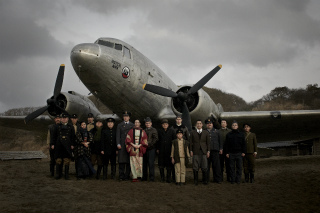 is a movie depicting exchanges between Sado's villagers and the crew of the transport aircraft of the British Royal Air Force "Dakota," which made an emergency landing in Sado Island shortly after the end of World War II. The movie, produced by Assyu Japan and directed by Seiji Aburatani, will be released on October 5, 2013. Villagers, who made great efforts from the simple desire to help people in trouble, overcoming the grief of having lost their families in the war and their hatred against former enemies, pose timeless major themes such as "kizuna bonding," "mutual understanding" and "rebirth." During the shooting done entirely in Sado for almost two years, many islanders cooperated by performing as extras, preparing meals to offer, and making movie props; their cooperation breathed life into this story that was in danger of being lost in history. a commemorative photo --- a scene from "Tobe! Dakota"
The film adaptation of "Fly, Dakota Fly!" was triggered in the summer of 2010 when the son of a British mechanic who had repaired the Dakota visited Sado to express gratitude on behalf of his father. In the wake of his visit, a local film commission made an effort for film adaptation, with a view to preventing the story from being forgotten. The entire filming was done from February 2012 to January 2013. Villagers in the Aikawa area where the filming took place not only performed as extras but also collected the kimono and accessories that were used in the movie, braided Japanese sandals used for filming, and made papier-mâché stones for the runway of Dakota. 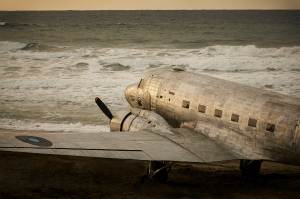 It the climactic scene where the Dakota started flying, some 700 local extras gathered together on the Sobama seacoast. As the production wanted to reproduce the situation at that time, it bought the same model in Thailand, took the model apart and sent the parts to Japan. It took about a month to assemble the model, which appeared in Sado Island with a length of about 19 meters, a wing-span of about 29 meters, and about 5 meters tall. Incidentally, the very Dakota that made the emergency landing in Sado was eventually owned by an American and carefully stored in Florida. Produced by the "Fly, Dakota Fly!" Production Committee. Co-sponsored by The Niigata Nippo and others. On January 14, 1946, 67 years ago, shortly after the end of the Pacific War, a British Dakota transport plane made an emergency landing on a tiny village of Sado. It was a completely unexpected visit by soldiers of the U.K., with which Japan had been fiercely at war until only five months before. The villagers were surprised and confused, and some of the British soldiers kept a wary eye on the villagers. With the pride of giving a helping hand to people in trouble, the villagers cooperated in repairing the Dakota for flying and decided to receive the British in the village inn until the repair was done. The villagers and the soldiers approach one another hesitantly, reach a common understand though they had been fierce enemies, get rid of their emotional walls, and gradually deepen cross-border friendship and kizuna bonding. About 40 days after the emergency landing, the day comes for Dakota to leave the village, with the villagers watching the Dakota take off.